Becky and the “5 is Enough” team are taking a cue from Dr. Seuss this year by taking action to make things better for those with breast cancer. 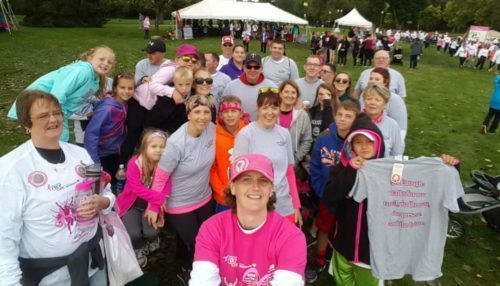 Family members and friends will gather for the seventh year to celebrate at the Race for the Cure. You’ll catch the team wearing their Dr. Seuss inspired hats and team colors — Black, Red and White — to honor the many family members and friends touched by the disease. Over the last few decades, Becky has lost a cousin, maternal grandmother and paternal aunt to breast cancer. Her cousin was just 38 years old and left behind a six-year-old daughter who is now being raised by Becky and her husband along with their three children. The team gathers from across the state with Becky and her family coming from Rapid City and her parents and brother coming from Huron. The team also includes other family members and friends who have been touched by the disease.